Provide comfort for the family of Margaret Stewart with a meaningful gesture of sympathy. 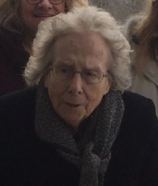 It is with profound sadness that we announce Margaret Frances Emma Stewart (Whent)’s passage to heaven at its scheduled time on Friday, February 22, 2019. 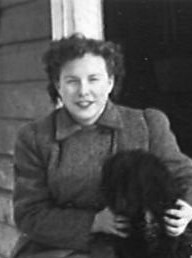 After 95 wonderful years, she has departed this beautiful Earth to rendezvous with her dear husband John (known as Jack) Cleland Stewart, son John Douglas Stewart, and brothers Vincent Hilton Pullman Whent and Duncan Daniel Ira Whent. Also predeceased by parents Mary Frances Whent (McCoshen) and Daniel Hilton Whent, and numerous other loving family and friends. Born July 25, 1923, Margaret (Frances) made this world a more interesting place. With a father who worked on the railway, she grew up in Hornepayne, Ontario. While working at the bank in Geraldton, she met John, who she said came to the bank so often, she thought “This man doesn’t know how to handle money”. After a short courtship, at the age of 28 she announced to her family that she was indeed getting married and to get the wedding planned. She birthed four wonderful children, three of whom are still living today. As John (Jack) was an OPP officer, they moved often but she managed to make every place a home. Finally settling on Ray Boulevard in Port Arthur, she was finally able to turn a yard into a beautiful garden. Growing many of her own vegetables and flowers, she found happiness amongst the plants and the plants found happiness with their caretaker. She also loved baking and anyone who has tried her shortbread was quick to realize it was the best they had ever tasted. Her pumpkin pies were the best treat at Thanksgiving (except for that one time when she forgot the sugar). She was loved and loved her family with every pulse of her being. She leaves behind numerous family members who miss her very much. Her loving daughters Kathy Fortes and Lynne Melnick (Terry) and son Don Stewart (Millie) of Kitchener, Ontario. Her dear grandchildren Wayne Fortes (Stephanie), Jennifer Fortes (Brent), Stewart Melnick, and Spencer Melnick. She is also mourned by her three beautiful great-grandchildren Jordyn, Harper, and Mayse. She also leaves behind numerous other loved ones. As requested, a private family funeral has taken place and mom’s “dance” on Earth is complete. At this time, we would like to thank the emergency doctors and nurses, Dr. Chow, Dr. Sung. Dr. Droll, Dr. Payandeh, Dr. Blondie, nurses Meagan, Monica, and Trevor of 3B, MET Team from the ICU, Dr. Ek and Tracey for years of care. To send flowers to the family of Margaret Frances Stewart, please visit our Heartfelt Sympathies Store. Provide comfort for the family of Margaret Frances Stewart by sending flowers. I have known Mrs. Stewart (that is what I always called my friend's parents as it is a sign of respect) ever since I met Kathy in Grade 9 at PACI, some 30+ years ago! Both of Kathy's parents were warm and friendly people. Every time I saw them they greeted me warmly, with a big smile. Or if they answered the phone when I called for Kathy they always asked how I was. Even this last December (the last time I talked to Mrs.. Stewart) when I called for Kathy and she wasn't home, Mrs. Stewart and I had a nice chat about how I was doing and although she never met my husband and my son, she always asked about them as well. Kathy, your Mom and Dad, and your family will be watching down on you, Lynne and Don and your families. I hope that the memories that you hold so dear in your heart will help you get through this difficult time. "Perhaps they are not stars in the sky but rather openings where our loved ones shine down to let us know they are happy". Always look up in the sky Kathy, and remember your loved ones are shining down on you.